Well, that was not the Mets best effort. Mets pitching gave up ten runs to the Phillies on ten hits — plus seven walks and three hit batters. That’s as many free passes as hits. The Mets managed only four hits and three runs, the runs coming on meaningless ninth inning homers by the red-hot Ike Davis and Jason Pirdie. The worst part about this (well, there was more than one worst part) is that the Mets were not facing Roy Halladay, Cliff Lee, Roy Oswalt or Cole Hamels. Not even Joe Blanton, who is on the DL. No, the Mets were up against some guy named Vance Worley (no relation to Jo Anne, I can only assume), a rookie making his season debut. All he did was throw six scoreless innings. Quite pathetic. 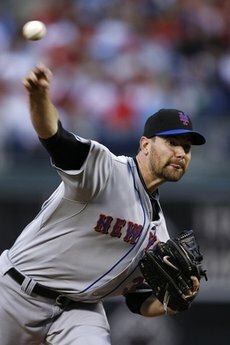 Speaking of pathetic, that brings us to Mike Pelfrey (left). He was awful yet again, lasting just 4.1 innings, allowing four runs and eight hits. His ERA is now a robust 7.39 on the season. Something must be done. The Mets broadcasters broached the subject of sending him to the minors to get straightened out. I don”t think that would work. It sounds like Pelfrey really relied on Dorfman and his advice. I don’t know if he is speaking with anyone else, but if not, he apparently needs to. And quickly, before his career is beyond saving.